Summer share runs 21 weeks from early June through the end of October. Members pick up at the farm once a week. Pickups are on Mondays and Thursdays from 3-6:30. Supported Shares are available to qualifying households at half price, until filled. Learn more about supported shares. ICF members get a great deal on their vegetables year-in and year-out. In 2018 , the retail value of a small share was 50% higher than the cost! In 2017, that number was 50%, and in 2016 it was 56%. For more information on the value of an ICF share, and the ways we try to make it affordable for everyone, see our page on share value. Most vegetables are already harvested, washed, and set out in our pole barn for members to select themselves. Some crops are available only as pick-your-own, and are in the fields immediately surrounding the pickup barn. For an additional $125, you can have some pick-your-own done for you. We will harvest a selection of the pick-your-own offerings during the more productive parts of the season (14 or 15 weeks) and have them waiting for you at the pick-up desk. Supplemental products like bread, cheese and eggs can be pre-ordered, or purchased on the day of pickup (while supplies last). For all the details, download a Summer Share Guide. Your particular diet, household size, and budget are the primary factors that should guide your choice of CSA share, but here are a few things to consider in choosing a share. A Large Share is about twice the volume of a Small Share, with the Medium about 1.5 times a Small Share. 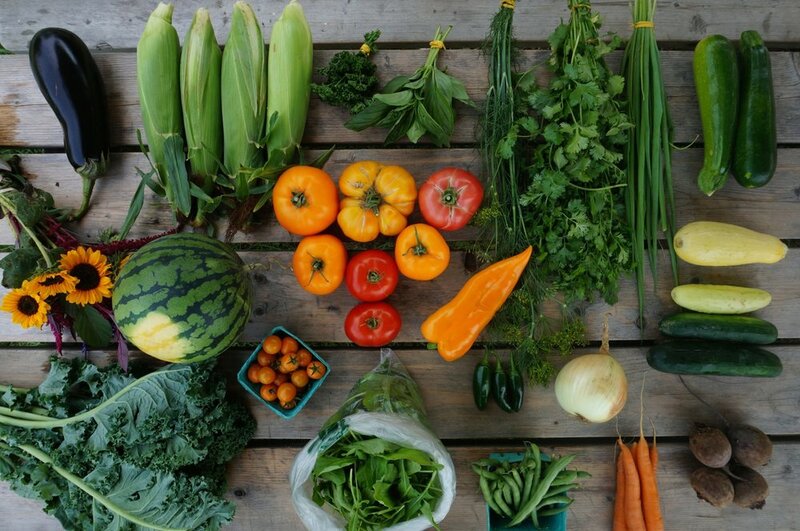 About 70% of our CSA members opt for a Small Share. You can change your share size at any point during the season and we will adjust the price accordingly. Very early and very late in the season, produce volume is lower than the remainder of the season. What Will I Get in my Summer Share? As part of a project with NOFA-VT, we took a photo of a sample small share for every week of the 2017 summer CSA. Check it out! A small share from August 17, 2017. For a detailed breakdown of when each crop is typically available, pore over our summer produce availability chart. Availability will vary from season to season.